Nitrogen fixation bacteria are vital; without them we couldn't exist. Nitrogen fixation bacteria in the roots of legumes provide the nitrogen for our amino acids; part of the fundamentals of healthy choice foods. These little bugs may make for a rather dull subject at first sight, but it's vitally important for every serious gardener to appreciate, even if not totally understand. And if you have any sort of science or biology background you'll find it fascinating; at least I did. Why are they so important? Because a shortage of the element nitrogen is the biggest limiting factor in vegetable gardening, one of my many hobbies. Low nitrogen equates to low vegetable yields. Plants require it and, in natural fields and forests, it's these bacteria that supply most of the goods. In modern agriculture, this is deemed inadequate, and too much schlep, so large quantities of nitrogen are supplied to the soil from fertilizer. However, there's always a but it seems. This nitrogen is very expensive to produce and transport, requiring large amounts of electrical energy, using the Haber Bosch process that you probably learnt about in high school science. In nature, the nitrogen is supplied by tiny bacteria that live inside the roots of certain plants, in particular for us, legumes; and by lightning. Legumes in the garden to reduce our reliance on red meat and dairy for our protein. Legumes to supply nitrogen fixation - the gas for all our other plants utterly dependent on the element in the soil, but unable to produce their own. So, if you want healthy lettuce, corn, broccoli... you either have to provide biological nitrogen fixation from legumes, or use artificial fertiliser. Or, perhaps a bit of both, depending on how fanatical you are about organic farming methods. Nitrogen fixation bacteria is simply a subject that no health and garden nut can afford to ignore! So, don't! Fava beans nutrition is a good place to start; it's our start to the day for most of the year; what's astonishing is that you have no hunger pangs for the rest of the day; that supply "satiety". There are some very smart bacteria; yes, there are billions of healthy, good bugs, as well as the pathogens that seek to destroy us. They have an enzyme that can capture the gas from the air and fix it into a soluble compound called ammonia. Remember the atmosphere is 80 percent nitrogen, but plants can't utilize it; nor can animals like us. Nitrogen is the basis of all amino acids, those vital building blocks of protein; our RNA and DNA too. These bacteria then convert the ammonia into these compounds for their own needs. Then, when they die, this nitrogen is released into the soil and becomes available to other plants like your lettuce and maize that need it for their genes; and hence to us for our own building blocks. Where do legumes come into this? Not all plants can become involved in fixation nitrogen. Your lettuce can't, and nor can your broccoli. You and I cannot either; but the pea and bean can. 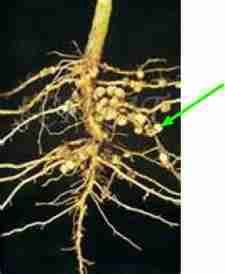 Legumes have special nodules on their roots where these unique nitrogen fixation bacteria find their way from the soil. Pull out a bean plant and check it out. See all those bumps? That's biological nitrogen fixation. You may be wondering what are legumes? Atmospheric nitrogen fixation by lightning is the lesser way of nature making the element available to plants, and hence to us. Every gardener knows too that in some mysterious way, rain associated with lightning is so beneficial to the vegetables. Within days everything is greener, with new shoots appearing; it's all about the formation of nitrogen oxides and ammonia from the atmosphere. 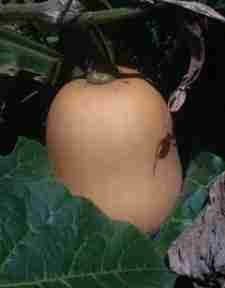 They are highly soluble, making the gas available to plants. Our own proteins are utterly dependent on the nitric oxides from the arcing effect of lightning, and the ammonia from nitrogen fixation bacteria. Researchers, by counting flashes from satellites estimate that lightning releases about 26,000 tons of nitrogen oxides into the atmosphere every year; that's small fry compared the biological fixation of the element, yet important. Gardeners have also known for millennia that a crop of vegetables, planted where last season there was a pea or bean crop, are particularly luscious and bear abundant fruit. And so gardeners use plant rotation; pea or bean, followed by lettuce or broccoli, for example, and then by a root crop like carrot or onion. And then back to the nitrogen fixation of peas and beans. This happy, symbiotic, mutually advantageous relationship between legumes and nitrogen fixation bacteria can make the organic gardener independent, or nearly independent of synthetic fertilisers. We can and should use biological nitrogen fixation to the advantage of our healthy living plants. 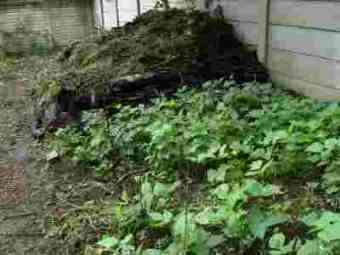 Starting a compost pile is the other side of the coin when you are trying desperately to grow healthy choice foods. Vegetable plants of course need a lot more than just nitrogen. Whilst biological nitrogen fixation is a vital "good gardening" practice, so is starting a compost pile for all the other nutrients that your broccoli, carrots and lettuce are going to need. And perhaps, if you love sufferin' succotash like I do, your first attempt will be at growing lima beans; beans are VERY healthy legumes for our own protein needs, as well as for their capacity to fix nitrogen. Later, I will be pulling up some old bean plants (it's the end of summer), careful to save bean seeds for next season, so I'll get some photos of the roots so you can see the legume nodules where these amazing nitrogen fixation bacteria are so busily engaged in providing for your garden. So, have you got it? Capturing unavailable nitrogen from the atmosphere and making it available to our plants. Even if you don't have a vegetable garden, as such, it's not difficult to plant a few pole beans here and there, or a few bush beans and peas between your other plants. The taste of organically grown veggies is without equal. Growing green beans need a compost rich environment. I have four compost heaps on the go; yes, we have a large African garden. Each year in the spring I'll grow a crop of bush beans in what's left of one of the piles of humus. Once we've reaped the crop, it's lush and prolific, then I just cover the bean plants, nitrogen fixation bacteria and all, to infect the new compost heap with these amazing little friendly bugs. Don't swallow the claptrap that the banting folk are giving out that legumes are bad for you because of the starches; it's very low GI carbohydrate and does not produce a fattening insulin rush like donuts, delicious white rolls and potatoes do. If you're still unsure, find out more about the meaning of starch. I photographed these two butternuts this morning, the one in virgin soil and the other, the monster, at least double the size, growing where last year I grew peas. In fact, peas planted in a trench of compost. See the influence of the compost and the effect of nitrogen fixation by the bacteria in the roots of the peas? 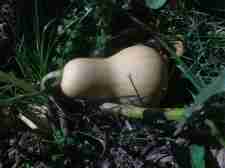 Growing Butternut Squash. Fixation nitrogen requires a great deal of energy. These amazingly little bacteria get it from aerobic respiration that provides the energy for an enzyme called "nitrogenase" to convert nitrogen from the air to ammonia. Mankind gets that energy in the main from coal- and oil-fired power stations that provide the large amount of electricity to manufacture nitrogenous fertisers. We are of course slowly but surely running out of fossil fuels. One day all of agriculture will rely on biological nitrogen fixation for our food, just like plants have done for billions of years before the arrival of man. Real progress goes backwards sometimes! Thought of starting to get some of your electricity from solar power energy? I, Bernard Preston, am typing this page in the early hours before dawn on my Apple computer and a 3 watt LED light entirely powered by the sun. 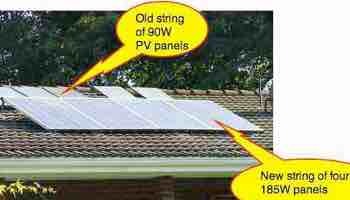 Sixteen photo-voltaic panels convert solar energy into electricity stored in four large batteries. I'm trying in some small way to ape those nitrogen fixation bacteria, shall we call it "solar fixation"?, helping to sustain the planet so that our children's children will still have a place to live once the world's fossil fuels have run out. Join me in becoming a environmental freak and being consumed by the need for plenty of energy and vitality, and leaving a wonderful legacy to your offspring. Bernard Preston's books are for all those who are enjoying this site; in part it's your way of thanking me for the huge number of hours going into teaching about healthy choice foods, harnessing the sun's energy and harvesting the rain. But in part they are spanking good reads. There are free chapters to whet your appetite. Father time from Frog in my throat. The early morning light is starting to filter through to the PV panels that are now registering 36 watts, enough for a dozen LED lights, but not of course enough for my Mac which uses 150W; for that I'll have to wait another hour for more intense sunshine. But the batteries are registering 72% charged, so I still have enough electrical energy, and a cup of coffee will provide me with the energy to start the editing of Book III of my latest trilogy. Book III, The Return of Klein-Jan is complete, but needs a good deal of editing, the painful part of being a writer. Update; it's now complete. Read Books I (The Bostonians) and II (Peter's kids)? Un-put-down-able. Only 99c each; and now Book III (The Return). 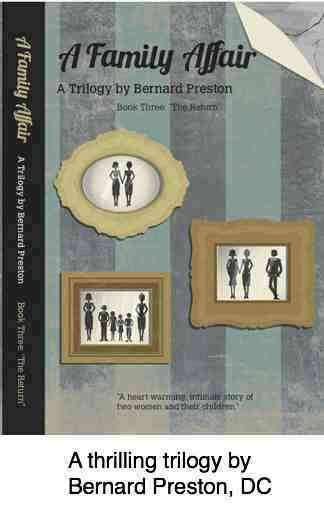 A FAMILY AFFAIR home page... more thought-provoking, inspiring books from Bernard Preston. This a controversial one; be prepared to be shocked. Update 1: It's now 8am, and the PV panels are now producing 900 watts, and my Mac is using only 150W. The rest goes into the batteries for storage. Quite soon she who must be obeyed will be starting the breadmaker for our solar bread. That draws 600W, but only intermittently for 50 mins, and by then the sun will be yielding nearly 3kW to our solar panels. More about that on another page. The long and the short of it: there's plenty of energy from the sun if you have the wherewithall to collect it and solar fixate the sun's energy. Did you find this page useful? Then perhaps forward NITROGEN FIXATION BACTERIA to a fellow book- and earthworm. Santie, from A Family Affair, and Giorgio discover they are half brother and sister.